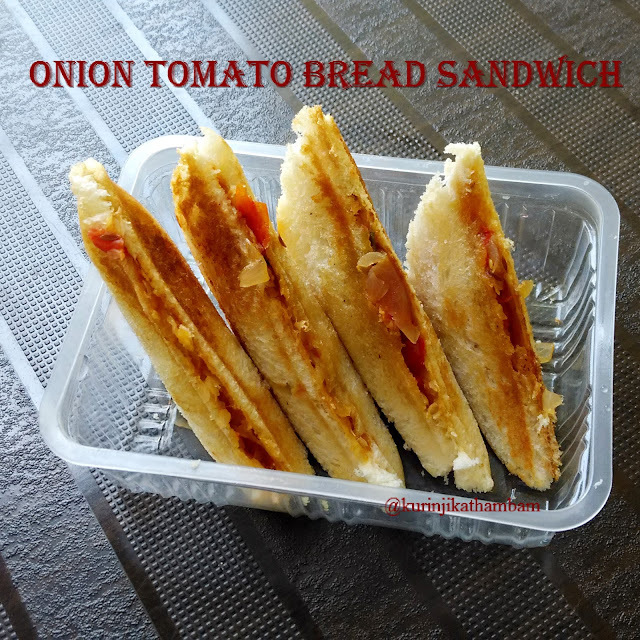 The good thing about Onion Tomato Bread Sandwich is the all the ingredients are daily used ingredients and will be always available in the kitchen. 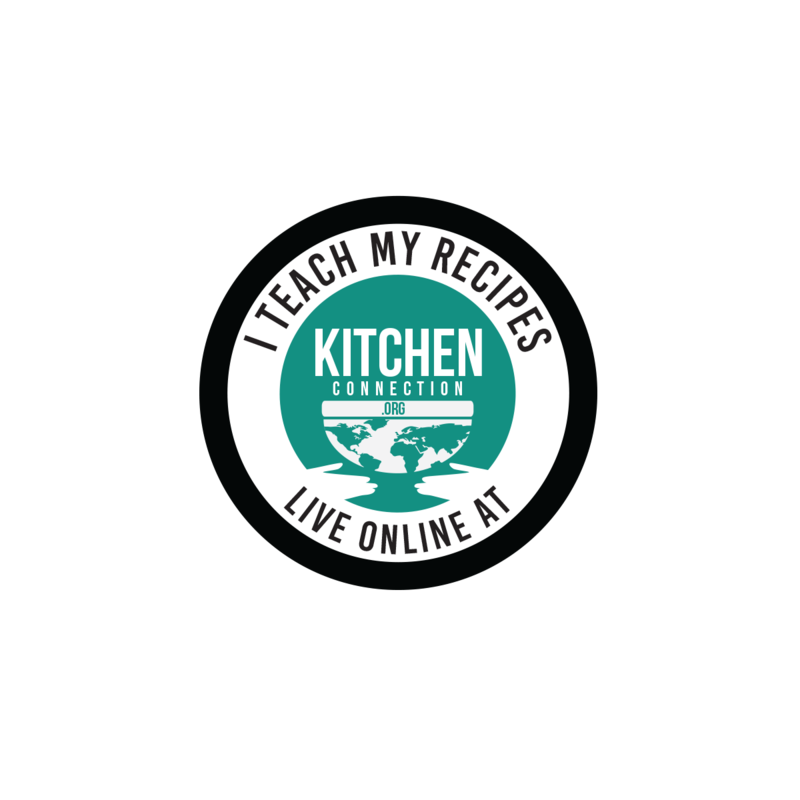 From availability of ingredients point of view, this is an easy and quick to make recipe. 1. Peel the skin of the onion and chop them into very very thin and small pieces. 2. Wash and chop the tomato into small pieces. 3. Heat the oil in a pan, add cumin seeds and wait for popping. 4. Then add the curry leaves and sauté for few seconds. 5. Next add the chopped onion (from 1) and sauté till the onion becomes translucent. At this time you should keep your flame at medium. 6. Then add the chopped tomato (from 2) and fry till the tomato becomes mushy. 7. Next add the red chilli powder and salt. Mix them well. 8. Sprinkle little water and close the lid of the pan. Cook until the raw smell of the red chilli powder goes off. Switch off the flame and add chopped coriander leaves. Mix them well and keep it aside. 9. Remove the brown edges of the bread slices. 10. Apply butter on both sides of the slices. 11. 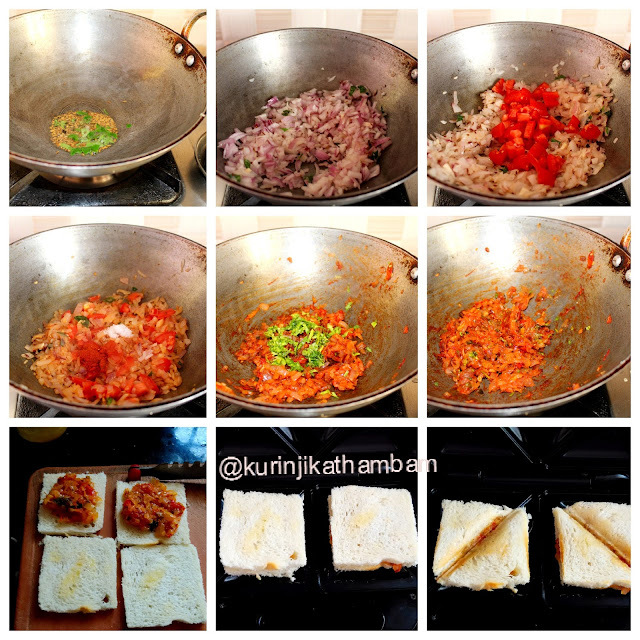 Spread Onion-tomato mixture on the 4 bread slices. Then close these slices with remaining slices. 12. Make the sandwich using the sandwich maker or grill. 13. Otherwise, apply butter and roast the slices until they turn into golden color. Now spread the onion-tomato mixture and cover it with another slice. Serve it immediately. 1. You can use wheat, ragi, madia breads. 2. Use tomato puree instead of tomato.